A true blue Mumbaiite, Hungama TV chief operating officer Zarina Mehta is one of the three founder members of United Television (UTV). Her child like enthusiasm for her work is contagious but at the same time, there is a fiery temper lurking behind somewhere. With no formal training in the media and television space, Zarina has come a long way from her early days of being an edit person. An Economics graduate from Mumbai University, challenge is what makes her tick. "The minute everything goes smooth, I am bored to death. I don't live for the result. I live for the actual act of fixing the problem. If there are no problems, I create one," says she. This year, from being programming head of UTV's kids channel Hungama TV, Zarina was made its COO. Kids' programming is what she is most passionate about and it also came through her shows The Mathemagic Show, Hip Hip Hurray and Shakalaka Boom Boom for Doordarshan, Zee TV and Star Plus respectively. Hungama TV under her stewardship has recently touched the number two position in the kids' channels space and the lady can't stop gushing about it. From being a shy, terrified and retiring young girl, who used to get bullied in school, Zarina has evolved into a confident media savvy woman. And the change came about when, as an eight year old, she came back to India from Washington (where her dad was posted). "The American system of education in school is so pathetic that when I came here, I did not know how to read or write at eight. I was enrolled in JP Petit High School for girls and that is where I changed completely. It was the most nurturing, fun and fabulous place to be in. Our principle, Shirin Darasha (she's still there), was the most fantastic principle anyone could ever ask for. She taught us to question everything. She opened up education for us and made it meaningful," reminisces Zarina. By contrast when she went to Xavier's, she hated every second of it. "It was complete rubbish. I studied Economics and if I asked a question in class, the teacher would throw a piece of chalk at me and ask me to get out. I believe English was really good because Rajdeep's (Sardesai) mom used to teach it. But I did a terrible mistake by taking Economics," she says. Confusion in her mind after graduation was what took her to Xavier Institute of Communications (XIC). There she studied advertising and marketing, only to realise that that was not what she wanted to do. The turning point in her life actually came in school, where she met Pearl Padamsee, who used to do theatre with them. "We used to do these magnificent school plays with her. That is what really became a career for me. It took me right through college," she recalls. Being an independent person by nature, she was loathe to take money from anyone even when she was young. And as soon as her studies got over, she started giving English tuition to kids and also approached Pearl Padamsee for a job. "I asked her to give me some work and she made me a production manager in one of her plays. Right through college I did a lot of theatre and that was my best training. Theatre teaches you discipline and also what the audience likes because you are an actor on stage and you get the reactions right there," points out Zarina. It was here that she met Deven Khote and Ronnie Screwvala. UTV, which is today one of the most respected film and television production companies, was born "out of fun." Reportedly, the trio started out with Rs 37,000 in their pockets to float the company. "The three of us decided to start this company just for fun called UTV," recalls Zarina. The first show they did was a television quiz called Mashoor Mahal for DD in 1989, which was hosted by Raman Kumar and created by Alyque Padamsee (who was the head of Lintas at that point in time). This was India's first independent production as all the other shows prior to this were produced only by DD. As for Zarina, her first tryst with the editing machine came with Mashoor Mahal. What she had to do was mundane but she was hooked and how. Zarina recalls with much enthusiasm, "Raman used to host Mashoor Mahal and when he used to start speaking, he had a habit of taking big breaths in between words. My job was to edit Raman's breaths! I used to come in to work at 7 am to Western Outdoor Media Technologies Limited (WOMTL) and learnt editing from someone there on a small machine with four buttons. I was so excited that I had learnt how to edit that I ended up spending the entire night at the studio. And much to my horror, my parents were frantic at home because they didn't know what had happened to me. I was totally hooked. Although now when I look back, I don't know what I was hooked on to, because all I did through the night was editing Raman's breaths!" The rest as they say is history, but it's still good to relive and recall history. Path-breaking shows that poured out of the UTV stable were Mashoor Mahal, Lifeline, Contact, Shakuntala and The Mathemagic Show - all for DD, since those were the good old days when the pubcaster ruled the skies. But the problem in those days was that DD did not allow any producer more than 13 episodes in a year. So, through the year, there were these "no work" periods as in those early days no one had heard of UTV. "No one recognised us when we told them we were from UTV. Only when we mentioned we were a part of Western Outdoor, did they recognise us," says Zarina. WOMTL used to be one of the oldest and most experienced players in the area of post production in India. 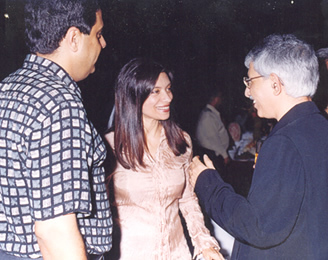 In order to strengthen its presence in the post production business, Screwvala's United Studios (USL) acquired WOMTL in March 2003, post which the brand name was changed to USL-WOA. Unlike these days, when production houses have been rightly named "soap factories" as they churn out more content than one can ever imagine, two decades back it used to take producers one and a half years to produce one show. "A whole of research used to go into our shows. 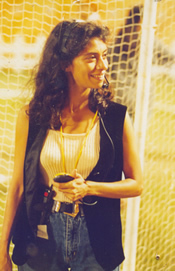 Lifeline was shot on film and its music was done by Vanraj Bhatia and it was directed by Vijaya Mehta. I still remember shooting on location at Nanavati Hospital. Now we look back at those days with nostalgia but the fact was that we were very bored half the time because DD would not give us more than 13 episodes a year. You put in all your love and energy into those 13 episodes," says Zarina. Then came the satellite boom in the early 1990s. Channels like CNN and Star Plus entered Indian skies. CNN broadcast the Gulf War of 1991 live on television and the face of Indian television changed. In August 1991, Richard Li launched Star Plus in India, which was the first satellite channel to be beamed in the Indian subcontinent. The year after that in October 1992 Subhash Chandra's Zee TV hit the airwaves. That was when UTV really burst forth. Recalls Zarina, "After producing 13 episodes a year, we produced 208 (52x4) episodes for Zee TV that year. We created blockbuster shows like Snakes and Ladders, Junglee Toofaan Tyre Puncture and Chakravyuh for Zee TV." A whole variety of programming was offered to Indian viewers. One thing that Zarina always did when she went to any channel was to offer them kids programmes, since she is most passionate about them. "The first show I ever did was Mathemagic, and then came Hip Hip Hurray and Shakalaka Boom Boom. Every time I used to go to a channel, I always had one kids' programme for them but very few of them wanted it. The first one to really recognise the power of kids programming was Star when we did Shakalaka Boom Boom for them," says she. In the 10 years that followed, Zarina was involved in an array of shows like Shanti, Parivartan and Saaya amongst others. One of them also happened to be the mega flop show - Kahin Na Kahin Koi Hai on Sony with Madhuri Dixit as the host. Zarina is smart enough to admit her mistake and sees this show as her biggest failure. "Kahin NA Kahin Koi Hai was my biggest failure ever. It was very difficult to recover from it and it was a public failure and I'm glad it happened to me because it definitely helped me. One tends to get a bit arrogant in life and Kahin NA Kahin Koi Hai brought me down a lot and that was good," admits Zarina. When queried as to where she thinks she went wrong on that show, she says, "I know exactly what I did wrong and I will never repeat it again. The only reason it didn't work was because it just wasn't real enough. It is as simple as that. You can't have an unreal reality show. And there were other problems too, which I don't want to get into. At the end of the day, we did put our hearts and souls into it and at that time nobody knew how to make a reality show so we should have recognised and fixed that problem. That was a mistake and the biggest failure of my life." 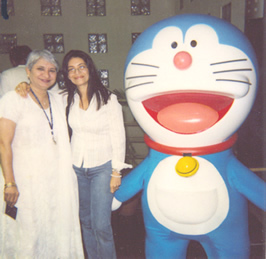 In March 2005, Zarina joined Hungama TV as head of programming and introduced local shows like Hero and Sanya at a time when the kids' channels space was dominated by international animation and live action shows. Hero became instantly popular among kids and also was amongst the top rated show on the channel. Sanya, on the other hand, was India's first interactive daily show for kids, wherein at the end of each episode, Sanya faces a dilemma and has two options to get out of it. At the end of every episode Sanya turns to the viewer and asks for help. Viewers can then vote via SMS, telephone or on the Sanya website www.sanya.hungamatv.com. UTV made two versions of each episode's ending and aired the version that garnered most votes from the audiences. She also introduced the Hungama TV Captain's Hunt, wherein the channel looked for kids to be on their board of directors to provide suggestions on what was right and wrong on the channel. The Captain's Hunt has received a hearty response from kids all over. Then came the Hungamathon - one of a kind mini-marathon for kids, which was held in Mumbai, Delhi and Kolkata. All these initiatives have made Hungama TV a truly home grown kids channel. Apart from local shows, some smart international acquisitions also helped the channel in a big way. Doremon is one of the most popular international shows on the channel. Now Zarina has another ace up her sleeve -- a first of its kind reality show for kids. 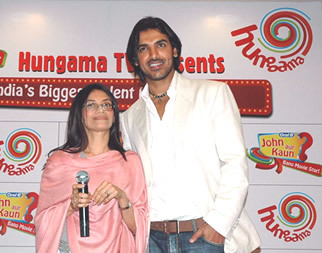 In what can be called a coup of sorts, Hungama TV has roped in current Bollywood heart-throb John Abraham for the John Aur Kaun? talent hunt where two kids who win the hunt will get a chance to star opposite John in a UTV produced movie. John will also be the brand ambassador for the channel for the next two years and will be involved in some innovative projects with the channel, which at the moment, Zarina is tight lipped about. When queried as to what she thinks is her biggest achievement, she says, "I think my biggest achievement is the way I work with people. I need them to have the same mindset as me which is hard working and go kill for the product - whatever it takes - if I may borrow CNN-iBN's tagline." "I hate hearing 'No' from people and that they 'can't' do something. Because the fact of the matter is that if you can't find a solution, I know I will. That's the way I work. I hate people coming to me with small irritating problems. There is no such thing as an insoluble problem. That's what I believe in and thankfully, all the people I work with also believe in the same," she adds. Failures like Kahin NA Kahin Koi Hai aside, what from her vast portfolio is her biggest achievement? "My biggest talent is to bring out the best in people and also to recognise a good idea and make it happen. And my biggest achievement is Hungama TV. I think whatever I am doing now is my biggest achievement. I never look at the past… because that has gone by. I have enjoyed my failures as well as my successes," she says. When queried as to what she thinks about the future of the television and media industry in India, she says, "The television industry space is really going to boom now. India is booming. Why is everyone going on and on about India? It is because it's going to boom. Look at any industry - the stock market, the media space, advertising spends... it is all on the rise. The only problem in this space is pay revenues, which seem to have got stuck and it is irritating. After becoming COO, I realised what a huge impediment it is to growth. If that were to happen, there will be massive growth. So I have the most fantastic sense of excitement. I don't think we have seen anything yet. It's still all to come."